This following article is a guest post from Alysia Butler. There are just moments in your life when your calling comes to you. When you just know – finally – what you’re supposed to do with your life. That moment happened to me this spring and it’s become the most important thing I’ve done since marrying my husband and starting my incredible family. My very dear friend and I are opening a parent-led sensory gym. As a non-profit. For special needs kids. But first…let me tell you a little bit about me and how we got here. I’m a stay-at-home mom with three boys ages ten, six and three. My husband and I moved to Hopedale, MA a little over six years ago. In December 2009, my whole world changed: my middle son was diagnosed on the autism spectrum at age 3 ½. He enrolled in our public preschool in their autism program and started occupational therapy services, as well as receiving one-on-one support in the classroom. We started learning words like “sensory integration” and “ABA therapy” and “social speech”. And as he learned how to interact with the world around him, we learned too. Two years later, our youngest would also be diagnosed as on the autism spectrum. It was at that preschool that I met an incredible group of autism moms, including my friend Tina Perriello. These women taught me so much about being a mother and an advocate for our kids and kids like ours. And it was with Tina that we saw a need missing in our community that we knew we needed to fill. Tina and I visited two open sensory gyms sponsored by our local autism alliance. These gyms had occupational therapy equipment specific to the needs of special needs children, similar to the equipment our kids use in their school therapy programs. Our kids were happy, the other kids were happy, and we felt the acceptance and support in the room. We knew we had to open something like that all year round in our town. And we knew we had to open it as a non-profit. We believe in the fact that all children deserve access to the types of therapeutic equipment used in their schools and their private occupational therapy clinics and we believe that parents need to interact with their children to learn what helps their child “feel better” and have fun. 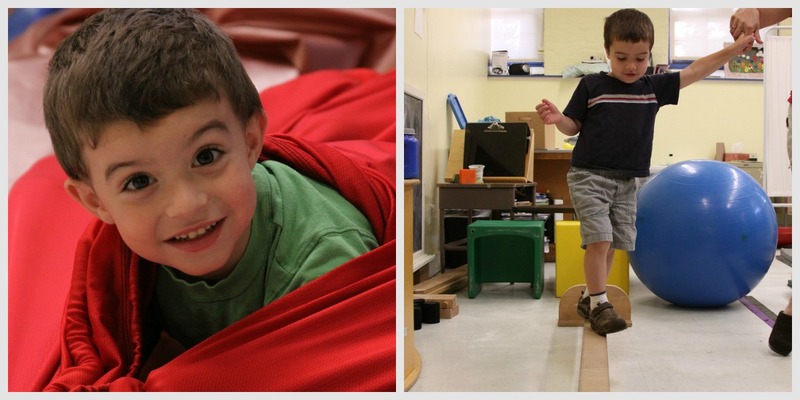 We see the gym as a place not only for our kids and kids like ours to accommodate their sensory needs, but also as a place to build their social skills and interact with other children like them. We see the gym as a place where moms and dads can interact with parents just like them – as another piece of the support team helping families know they are not alone. As a non-profit public charity, we are completely reliant on donations, grants, and our membership dues to stay open. None of us are taking a salary. All the money we raise goes right back into keeping the gym open and running: rent, electricity, equipment, furniture, and insurance. We are hoping for a grand opening in January 2013. I cannot wait to see the smiling faces on the kids that come through. Note: You can read more about SenseAbility Gym’s programming or donate via their website. Alysia lives in Hopedale, MA with her husband and three sons. She is active in the special needs community through her volunteer work, specifically as the managing editor of the SPD Blogger Network, a website designed to connect parents of children with sensory processing disorder, and through her own personal blog Try Defying Gravity. She is also the co-founder of The Oxygen Mask Project, a site designed to remind parents to take a breath and take care of themselves while they take care of their children. Thank you so much for sharing our story! Can’t wait to see you again soon. You’re welcome, Alysia. I hope the next time we see each other, you’ll be giving me a tour of the gym! Chris Carter recently posted..Grab The Flag!! Thank you so much! We’re so excited to see our dream come to life. Hello from St. Louie. Stopping in from SITS. Thanks for sharing. This post is near and dear to my heart as our son is on the Autism spectrum. I bet this gym will not only help kids but parents too! As a place to meet and connect and share what has or hasn’t worked to help improve their child’s life. That’s the goal of the gym, to help both parents and kids. I hope it’s a huge success! That is exactly our hope! We want parents and children to connect, to share stories, and gain support from one another. Thank you for reading and cheering us on!